I’ve been a big fan of the Dark Knight for as long as I can remember. In fact, ever since I began collecting comics as a young child, Batman was always one of my favourites. So naturally, I absolutely had to experience Batman: Arkham Asylum as I’ve been waiting a very long time for the prospect of a really good video game based on Batman. The last Batman game I played and enjoyed so much was The Adventures of Batman and Robin for the SNES. I remember being so hooked on the game that I played it over and over again. It had it all with great gameplay, engaging fight mechanics, fun level design and memorable boss battles. Batman: Arkham Asylum is a game that easily offers up all of these features and more. And by more, I’m not kidding. Let’s start with the game’s voice acting. It is absolutely superb. Veteran voices in the form of Kevin Conroy as Batman and Mark Hamill as The Joker are not only spot on, but more so a necessity. For those unaware, both Kevin Conroy and Mark Hamill famously voiced Batman and The Joker respectively in Batman: The Animated Series that ran in the early to mid 90s. Not having either to provide their voice talents would have been complete bats-phemy. The supporting voice cast is also fantastic and nicely compliments the entire package – Wally Wingert as The Riddler and Arleen Sorkin as Harley Quinn are fine examples of this. Another great quality of this game is the story. In keeping with the connection to Batman: The Animated Series, Paul Dini who penned many episodes as well as other Batman animated shows and movies wrote the back story for Arkham Asylum. And it shows...it is classic Paul Dini with a gritty edge and sharp delivery that can only do justice to the Dark Knight. Add to it just the right amount of Joker-esque satirical humour and you’ve got yourself one entertaining game. Gameplay is equally good. The game's FreeFlow Combat System offers up a very satisfying execution when ‘throwing down’ with enemies. The concept is simple; however the actual mechanics requires co-ordinated timing and the right directional movement. What this means is if you button mash, you’ll likely take a good amount of damage. Most of the fighting within the game is against multiple opponents of usually 3 – 5 and a good handful of them against 10 or more. In these situations, it is necessary to anticipate the need for counters and to be able to rack up enough multiple hit combos in order to then pull off a variety of special moves. Once you’ve managed to get the FreeFlow system down, fighting is pure bliss. Even the added touch of a slow-mo animated sequence when taking out a final opponent is sweet, sweet eye candy. 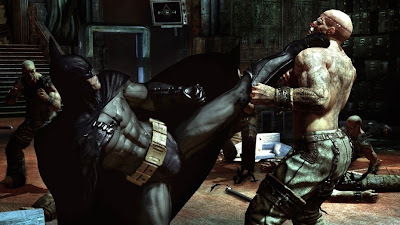 To compliment Batman’s skillful and effective hand-to-hand combat, there are a number of gadgets at your disposal. Items such as the grappling gun, Batarang and explosive gun all come in quite handy. But the most useful is the detective mode. When in detective mode you can assess your entire environment in an x-ray like scan. This allows you to see and anticipate enemies and discover hidden items that would likely be covered or missed. While this is a great feature, it can at times be too depended on to make the game that much easier to play through. I found myself having to forcefully turn off this feature consistently so as not to lessen the difficulty of the game. Another notable area regarding gameplay are the boss battles. As Batman, you will go head-to-head with some of his greatest foes – and there are a good amount of them in the game. Without having to give away too much, I will say that the ones against Killer Croc and Poison Ivy are likely the game’s best and offer up a good test of Batman’s skills. In addition to foes that you physically engage with, you also face off against The Riddler throughout the entire game. There are a total of 240 riddles that can be uncovered in the game and as you find more of them, The Riddler will communicate with you through a private radio frequency to taunt you along the way. Solving all 240 hidden riddles will allow you to take care of The Riddler in a certain fashion. What that is, I won't say...you'll have to find out for yourself. I mentioned the term eye candy previously and rightfully so. This game possesses a level of visual quality and artistry reminiscent of the Gears of War series. Not at all surprising given that the game was developed using the Unreal Engine 3. All of the game’s characters and environments are stunning and such a feast for the eyes. Batman is wonderfully created in the demeanour of the worn and battled vigilante that he is while The Joker is very detailed with a look that is both sadistic and calculated. Lighting and shadowing are so well done and easily set the right tone and atmosphere to enhance the overall mood. It is unmistakably Batman in his best element – dark and imposing. Batman: Arkham Asylum is such a great game and offers so much in one package that I felt I needed more at least in the story mode portion of the game. I really could have used a few more hours to truly satisfy my Batman video game appetite. Sure, there are the challenge maps that offer up some great extended and competitive gameplay (especially being able to play as The Joker if you have the PS3 version of the game), but depending on how interested you are in leaderboard rankings, that could get old quickly. But all that said, this is a wonderful game. Perhaps the greatest Batman game yet and one that has likely set the bar for all future Batman games to come. Great review, Andrew. BestBuy.ca finally shipped me this game after a month of delay so I'm very psyched to start playing it tonight.